Why can't liberals accept victory? If health care passes, will it be a grand historical achievement, or a crushing disappointment? The answer, I predict, will be both. The American health care system is an indefensible morass of waste and cruelty. The distance between the status quo and the ideal is therefore so vast that we could—and probably will—end up with a reform that massively improves the system, while coming nowhere close to the ideal. Which basis of comparison will prevail? In the long run, obviously, the substantive merit of the legislation is what counts. But, over the next few years, President Obama’s political capital will hinge in part on whether Americans see health care reform as genuine progress or a political fig leaf. And his biggest foe in the perception battle seems to be the liberals. That’s what happened in the aftermath of the economic-stimulus package. Indeed, the contours of that episode strikingly resemble the health care debate. Obama began with hopes of winning broad bipartisan consensus for a sweeping overhaul. But staunch GOP opposition and the fecklessness of moderate Democrats forced him to scale back both his political and policy ambitions. Ultimately, he eked out a partisan bill, which moderates scaled back for no coherent reason other than to burnish their own centrist credentials. As a matter of policy, the stimulus still represented a major success. The law signed by Obama is massive. Yet a bizarre disconnect has opened up between economists and everybody else. As numerous articles have shown, economists believe almost unanimously that the stimulus has provided a significant boost. Polls, though, show most people think it either has done nothing or has hurt the economy. Republicans have pounced, waving around proposals to cancel the stimulus. Why did Obama’s substantive triumph turn into a political liability? One reason is that the Keynesian intellectual basis for the stimulus is harder to explain than the intuitive (but wrong) gut reaction that when times are tight, the government should tighten its belt, too. Another is that joblessness has continued to rise, and explaining that it would have risen more quickly without the stimulus is tricky. But, surely, a third factor came into play: the almost total lack of approving commentary. Liberals like Paul Krugman and, um, me devoted nearly all of their efforts to demanding a bigger and better stimulus. That sort of constructive criticism is necessary. It’s certainly cathartic as well, given the maddening stupidity of the centrist compromises, which removed the most effective parts of the stimulus for the sake of meeting arbitrary round numbers. Yet this left a landscape in which one side was attacking the stimulus as a socialistic outrage, and the other was attacking it as a feeble half-measure. No wonder the public turned against it. And, of course, every bill would establish a practical entitlement to health care. The extent of the coverage remains weak. But remember that the original Social Security Act not only offered meager provisions and no disability benefit— Got hurt in the factory and couldn’t work? Tough luck—it also excluded nearly half of the working population, including most women and African Americans. The important point was setting a new societal expectation of what constituted basic economic rights, which, over time, would be filled in so that the reality met the promise. Fifty years from now, the notion that people would die from lack of access to medical treatment, or lose their homes and life savings because they got sick, will seem as barbaric and foreign as the notion of the elderly dying in poverty did after the establishment of Social Security. So why are liberal activists, bloggers, and even members of Congress so sullen? First, they think anything that has the support of the insurance industry must be bad policy. And, while it’s true that the interests of insurers and the interest of good policy work at cross-purposes, they aren’t mutually exclusive. Insurers want government to cover the uninsured, and they are willing to cut some fat from their profit margin to tap into that new customer base. Second, liberal health care activists have come to fixate on the public option as the end-all, be-all of reform. “If Barack Obama’s health care plan gets changed to exclude a public option like Medicare, then it is not health care reform,” insists Howard Dean. 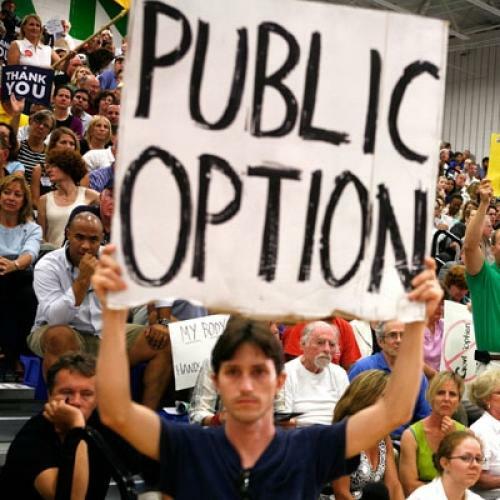 “Legislation rises and falls on whether the American public is allowed to choose a universally available public option or not.” It’s worth recalling that Dean’s own health care plan from 2004 did not include a public option. Most liberal health care wonks think a public option is helpful but not vital. Maybe they’ve all been bought off by the insurance industry, but I doubt it. If anybody sees Jonathan Cohn tooling around in a new Bentley, let me know, and I’ll reconsider. Liberal Democrats in Congress understand that they won’t have any leverage unless they can credibly claim to vote against reform that falls short of their ideal. This requires them to say things like “health care reform without a public plan is not reform.” It becomes a problem if enough people actually believe their own bluff.